SACRAMENTO REGION, CA (MPG) - Eppie’s Great Race (otherwise known as the World’s oldest no swim triathlon) concluded after its 45th year on Saturday, July 21, and celebrated its contribution to our area’s history. Founded by the late Sacramento-area restaurateur/entrepreneur Eppie Johnson in 1974, the race became an annual summertime tradition for elite athletes, fitness enthusiasts and families. 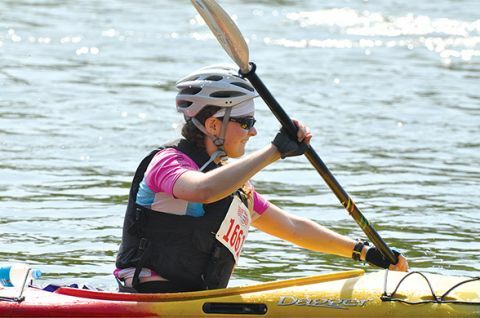 This last contest featured a 5.82-mile run, a 12.5-mile bike route and a 6.35-mile kayak paddle held along the scenic American River Parkway. It started and finished at the William B. Pond Recreation Area located at the end of Arden Way. The race was organized by the Eppie's Great Race Foundation and the primary beneficiary is the Therapeutic Recreation Services Division within the Department of Regional Parks which provides therapeutic recreation opportunities for individuals with disabilities residing in Sacramento County. To date more than one million dollars have been raised for therapeutic recreation services since the race’s inception. The Foundation and the Johnson family decided to end the Great Race after its 45th year, noting that Eppie was 45 years old when he started the event. While this unique challenge will fade into history, the Foundation will continue to sponsor Eppie’s Kids Duathlon, featuring running and bicycling, for children ages 3 to 13, in the fall – and the Foundation is set up to continue funding Sacramento County Therapeutic Recreation Services despite the triathlon’s demise.